Our Capital Campaign - Welcome to Puzzle Pieces! OUR clients and community helped us reach $64000.00 in 60 days! Thank you so much for your support! Thanks to everyone we were able to purchase out building! Tyler Lamar - There so many words and phrases that come to mind when I think about my son, Tyler. Tyler is now 20 years old and brings the sunshine into any gloomy day and he often reminds me of that with his impulsive dancing, singing, contagious laughter, Christmas movie obsession and an unconditional love for everyone he meets. I did not know I was going to have a child with Down syndrome 20 years ago, but I knew that I loved him very much just like I did his sister that had been born two years prior. I knew no chromosome count would weigh on that bond and it never has. It only sent me into a deeper desire to be a better teacher of children with special needs, a better person, and a stronger advocate for those who cannot avocate for themselves. Ty is a young man that makes people linger at green lights. What I mean is that he is always singing and dancing in the car and rocking so vibrantly that the people beside us have to smile and take in all his enthusiasm for life way after the light says go! In a world so full of violence, racism and intolerance, I hope for one moment that none of those worries consume that spectator at the light. Even if they don't fully understand, hopefully, Tyler can leave them with the thought of a happy and carefree world that only he understands. What a gift to have and pass on during a time of brokenness in many lives. Thank you Tyler, my son, my blessing for showing me another side to life. Thank you Puzzle Pieces for giving my son a place to learn and grow so I can provide for our family and continue to teach those with special needs. Karlie Hempel - See Karlie's smiling face? This is what she brings to people, this is her gift. She brings her light and shines through her difficulties. We did not know Karlie had Cerebral Palsy until she was 18 months old. She was born of a full term and uncomplicated pregnancy. So from that day forward our family adapted and moved forward. We did not want pity! We lived and live each day to the fullest and give Karlie and her older sister Katelyn those possibilities equally based upon their needs, period. Karlie is a fighter and fights for her independence and while this is good in most circumstances was a challenge in early school years :-). When our family moved back to mom's hometown of Owensboro and Karlie moved in to Burns Middle School and Amanda Owen's classroom we hit the jackpot! From that day forward she made friends, we were able to take her off ADHD medicine and she finally had a teacher who took the time to trully work through her non-verbal frustrations fully. Karlie is 18 now, has blossomed and is quite the social butterfly. She has many friends (very special one is Lauren Tucker) and is very boy crazy. She is well known in town and her family is known as "Karlie's mom, Karlie's dad" when out in public. We worried about the future as Karlie has gotten older and when we first heard of the concept from her teacher, Amanda Owen, we were in all the way. What better way for a social butterfly to thrive and spread her wings then to have a special place to do this for as long as she is able! Alex Snyder - Alex was diagnosed at 2 years and 8 months with a mild to moderate form of autism. I will never forget that way or how I felt as we drove back from the appointment. What is autism? I have only seen Rainman….is that how he will be when he grows up? What can I do for him now? I was in over my head but I am a researcher to an obsessive degree. And I pushed. Getting by is not in my vocabulary and it would not be in child’s either. He was a smart, delightful little toddler that always had a smile and hug for those he loved and I wanted him to grow into a happy boy and then a happy teenager. So far, so good! We continued with First Steps that was in place for his speech issues. He quickly began using the PECS (Picture Exchange System) and Sign Language to communicate. At around the age of 2 ½, we focused more on the sign language, making him at least communicate that way with us instead of simply giving us a picture. This, I believe was a turning point. He had to work at communicating and although communication was uncomfortable for him, he was rewarded for his behavior. He has continued to grow and succeed with each step he takes. Alex finished his 7th grade year earlier this year. He had a tough start to the new year with a new routine, building and teachers, but they all held on and before long he had taken them all by surprise with what he is able to learn. Alex received the Presidental Award for Academics for his group in the 7th grade. What a kid!!! To say that Alex depends on Puzzle Pieces would be taking it lightly. Puzzle Pieces is his home away from home. He knows he will be accepted for his quirks, silly jokes, and routines there. He dashes in the door every day I drop him off in the mornings in the summer. Alex also attends Puzzle Pieces for afterschool. His great care takers have really assisted the family with getting his homework completed or at least worked on it so he has more free time at home in the evening to spend with us doing things he loves. Alex is just an awesome kid. He loves Legos, Minecraft, YouTube, etc. He recently told someone that he wants to go to college and learn how to make video games. Well his family is 100% behind him….his home, Puzzle Pieces, and school families that is! Trent Biever - Trent Biever is a beautiful 11 year old boy who courageously works to overcome Autism, Epilepsy, OCD and Mood Disorder every day. Trent needs a tremendous amount of structure in his life and routine everyday. Puzzle Pieces has provided our family the ability to provide Trent with structure and routine as well as exciting social and communicative experiences which further help to maximize his abilities. Trent loves Puzzle Pieces and gets up early every morning excited to go see his friends. Trent has been able to learn essential social skills, life skills, self help skills, self advocating skills as well as make friends and have fun. Puzzle Pieces is an amazing blessing for our family and many others as well. There is no other center in our region designed to help children and adults like Trent become all they can be in the manner that Puzzle Pieces does. 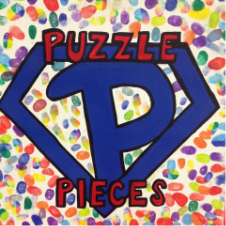 My family is thankful for Puzzle Pieces and is proud to support this amazing cause. Leah Abell - Leah joined our family on September 4th, 1997 weighing in at a whopping one pound and 10 ounces! She was three months premature. Complications from her early arrival resulted in cerebral palsy that caused Leah to have decreased physical abilities which has left her confined to a wheel chair. She requires complete assistance with all of her daily needs and desired activities. I recall my aunt giving me a book when Leah was first born titled "You Will Dream New Dreams". At first I didn't like the book as it was stories from parents of children with special needs and that wasn't the life I had envisioned for our Leah. However, I soon realized that instead of dreaming of Leah being successful in a profession or marrying and raising a family that I would begin to dream about Leah having a life of purpose and self-worth and I would dream about her having a place where she fit in and was accepted. If comparing Leah's life with that of Maslow's hierarchy of needs, it's easy to see how Puzzle Pieces meets those needs for Leah to live a satisfying life. At Puzzle Pieces Leah has her physical needs met, she is safe in her surroundings, she gets to socialize and develop relationships. At Puzzle Pieces, Leah enjoys befriending other clients as well as making friends with the many of the employees. These friendships extend beyond the walls and hours of operation and gives Leah great fulfillment. Leah has opportunities to shine which increases her feeling of self-worth. Through the program at Puzzle Pieces, with help from the staff, Leah is able to identify and work toward pursuing lifetime goals and achievements. I pray Puzzle Pieces will continue to grow and evolve and will be able to serve Leah for the rest of her life. 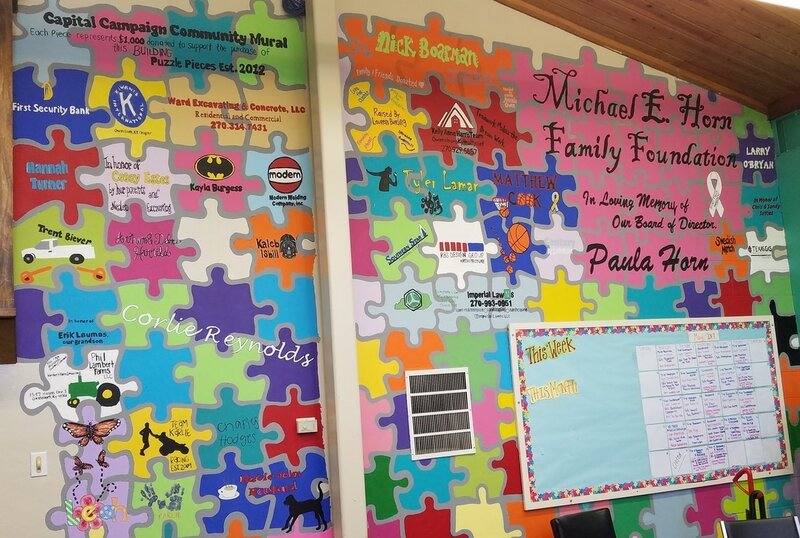 Puzzle Pieces really has become a dream come true for so many individuals and their families.